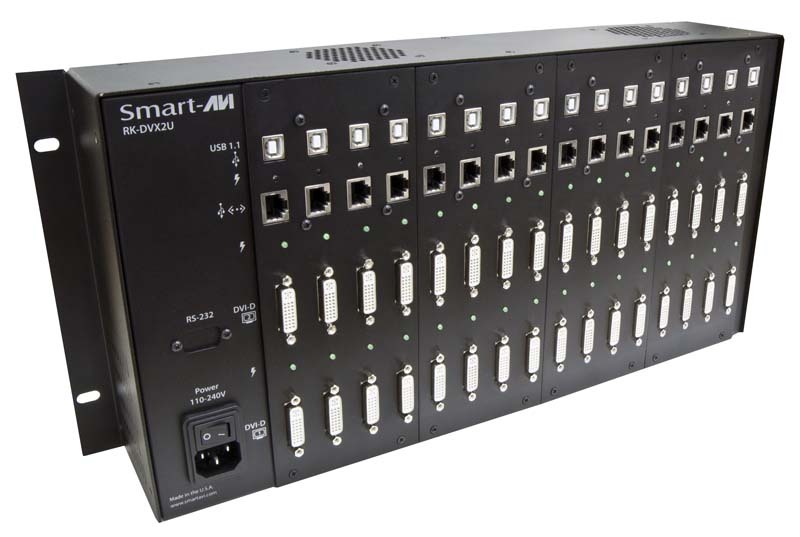 SmartAVI's RK-DVX2U extends up to 16 dual-head DVI-D and USB 1.1 device signals to remote locations up to 275 feet away over inexpensive CAT5/6 cables. Powerful, Rack-Mounted Extension for HD Video and KVM The RK-DVX2U extends the range of dual-head DVI-D 1080p (1920x1080 @ 60Hz) Full HD video signals for stunning high resolution picture on up to 16 remote displays. Better yet, the RK-DVX2U features USB 1.1 extension for keyboard-mouse operation on other PCs, perfect for consolidating digital workflow and centralizing control of systems within range. Outstanding Extension for Multi-Device Environments The RK-DVX2U excels in a variety of environments where unity between multiple displays or PCs is key for success. 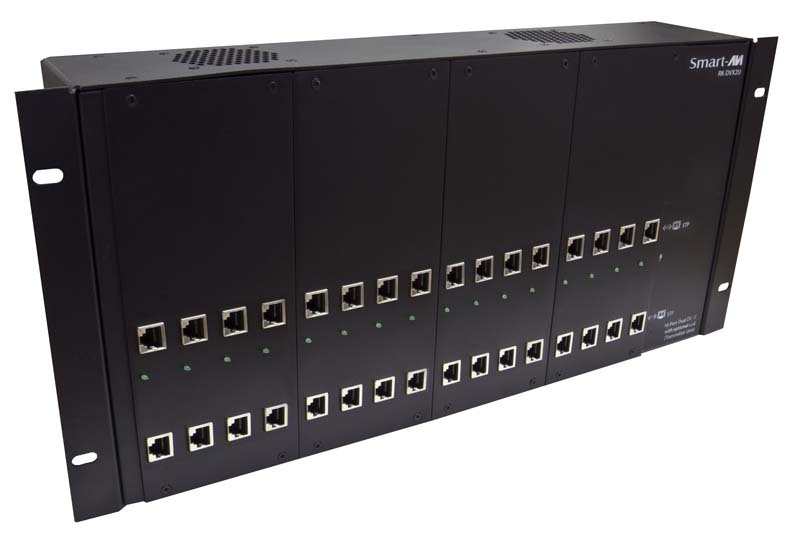 A great fit in data centers, office buildings, entertainment venues, transportation hubs, and medical facilities, the RK-DVX2U easily installs into rack-mounted AV set-ups with its intuitive plug-and-play design. The RK-DVX2U also features cost-efficient STP (shielded twisted-pair) CAT5/6 extension cabling, which is popular, reliable and protected from interference. MEDICAL FIELD In the medical field where sensitive electronic devices are used, isolating workstation computers can be a matter of safety. 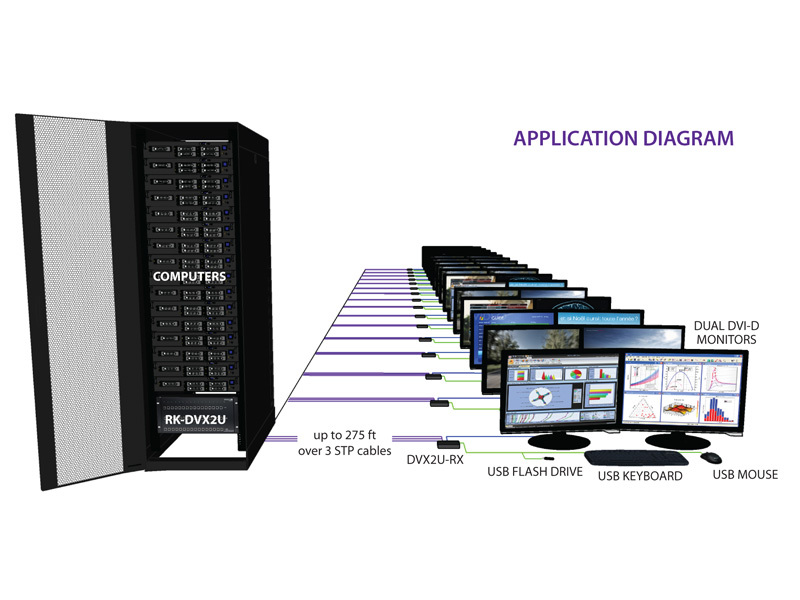 The RK-DVX2U allows the workstation computers to be housed in a central location, away from sensitive devices. INDUSTRIAL WORK AREAS In industrial work areas that may be too harsh for a workstation computer, the RK-DVX2U can consolidate the computers into a safe location. DIGITAL SIGNAGE When it comes to Digital Signage, the RK-DVX2U is an excellent deployment option. With the RK-DXV2U, up to 16 digital signage devices can be centralized and secured from public access. INFORMATION KIOSKS/DISPLAYS As with most information booths and kiosks, there is a risk of damage or theft. 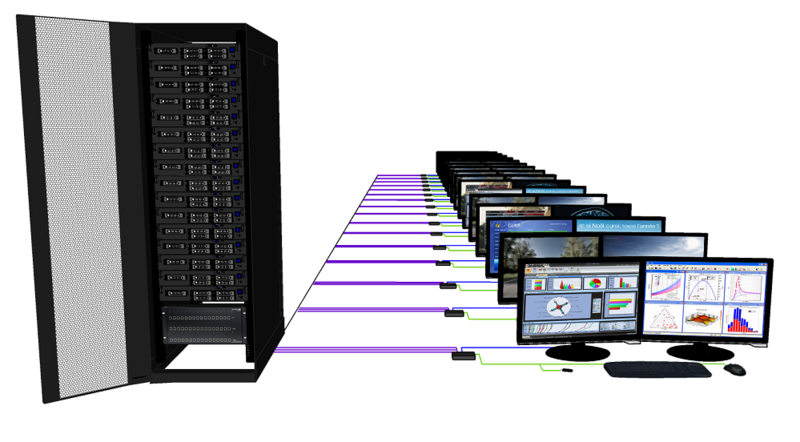 The RK-DVX2U is the best way to secure computer hardware, by consolidating it to a secure location away from public access. FILM/MUSIC RECORDING STUDIOS When recording with sensitive cameras and microphones, computers are often too noisy to be used in the immediate vicinity. The RK-DVX2U isolates the computers into another room, maintaining the silence that recording artists require.